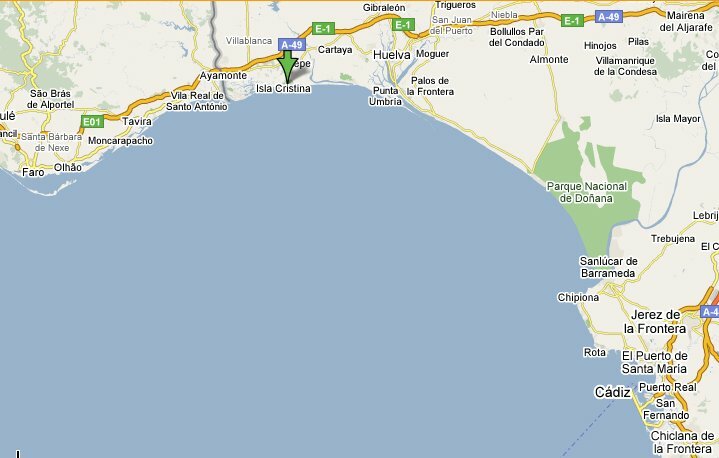 Where is Isla Cristina and Islantilla ?. Islantilla is a modern tourist Golf complex situated 30 km form the Algarve, 400 meter from the wide golden sand beach of Islantilla on the Atlantic coast of Huelva. This region is already renamed as the 'Andalusian Algarve' because is only separated from Portugal Algarve by the Guadiana River. Although is only 2 hours by car to Costa del Sol, The costa de la Luz is nothing about it and as it get more known by the abroad tourist, people fall in love by its unspoiled beaches, climate, food ( tapas seafood, .. ). But islantilla is more that a magnificent 27 hole golf course. Two impressive shopping and leisure centres, not more that 150 meters, cinemas, a sailing school, restaurants, "chiringuitos", clothes shops, and numerous quality hotels. More that 3,000 annual hours of sun and a mean temperature of 22 degrees turn Islantilla in one of the best tourist resorts in Andalucia. Map 1. Huelva is the South of Spain, near Algarve and Cadiz Province. Luxury Golf holiday Villa rental direct from the owner.